Christian DOUGLASS was born in Scotland circa 1758. (Birth date based on age at death). [S444] Book - James Fergusson and Robert Menzies Fergusson, Records of the Clan Fergus(s)on, page 208. [S117] Census - 6 Jun 1841, UK census, Scottish GRO 384/00 001/00 003. [S452] Book - revised by Alison Mitchell John Fowler Mitchell & Sheila Macbeth (Mitchell), Monumental Inscriptions pre-1855 Perthshire, Moulin Churchyard, entry #146, p254 or p419 in 1st edition. [S564] Book - North Perthshire Family History Group, Moulin Churchyard Monumental Inscriptions, see entry F11, p12; visited and checked by D Ferguson Apr 2009. [S452] Book - revised by Alison Mitchell John Fowler Mitchell & Sheila Macbeth (Mitchell), Monumental Inscriptions pre-1855 Perthshire, Moulin Churchyard, entry #147, p254 or p419 in 1st edition. 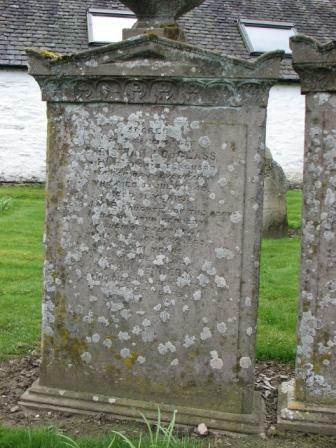 [S564] Book - North Perthshire Family History Group, Moulin Churchyard Monumental Inscriptions, see entry F12, p12; visited and checked by D Ferguson Apr 2009. [S612] GRO Scotland, birth/bapt record, Parish of Logierait, OPR Births/baptisms, GRO 376/00 0020 183 FR496. [S612] GRO Scotland, birth/bapt record, Parish of Moulin, OPR Births/baptisms, GRO 384/00 0010 77 FR082. [S612] GRO Scotland, birth/bapt record, Parish of Moulin, OPR Births/baptisms, GRO 384/00 0010 90. [S612] GRO Scotland, birth/bapt record, Parish of Logierait, OPR Births/baptisms, GRO 376/00 0020 230 FR543. [S265] Book - Edgar T. Jones, George & Martha Clarke Family Tree. [S284] Index - New South Wales BDMs online, at http://www.bdm.nsw.gov.au, Birth Reg. No. 3412/1907. [S222] National Archives Film - NSW Between the Wars Index; microfiche, Entry No. 8344. [S976] Newspaper - Goulburn Evening Post, issue of 10 Apr 1930, p2, col 4, Weddings. [S976] Newspaper - Goulburn Evening Post, issue of 28 Dec 1932, p2, col 3, Weddings. [S928] BDM NSW Registry, marriage record, Reg. No. 16371/1932. [S396] Ryerson Index to Australian Newspaper Death and Obituary Notices, at http://www.rootsweb.com/~nswsdps/dpsindex.htm, death notice and obituary in Goulburn Post of 23 Jun & 27 Jul 1988; aged 82. [S396] Ryerson Index to Australian Newspaper Death and Obituary Notices, at http://www.rootsweb.com/~nswsdps/dpsindex.htm, death notice in Goulburn Post of 3 Nov 1992; aged 85. [S160] National Archives Film - NSW Pioneers Index; microfiche, Entry no. 3266. [S284] Index - New South Wales BDMs online, at http://www.bdm.nsw.gov.au, Birth Reg. No. 003266/1898. [S222] National Archives Film - NSW Between the Wars Index; microfiche, Entry No. 3465. 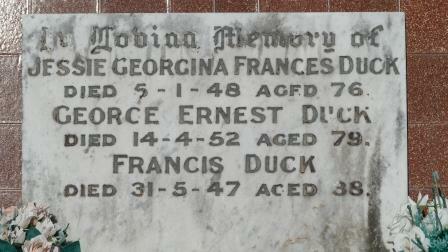 [S284] Index - New South Wales BDMs online, at http://www.bdm.nsw.gov.au, Death Reg. No. 22093/1951. [S396] Ryerson Index to Australian Newspaper Death and Obituary Notices, at http://www.rootsweb.com/~nswsdps/dpsindex.htm, Goulburn Post of 22 & 28 Aug 1951. [S976] Newspaper - Goulburn Evening Post, issue of 22 Aug 1951, p4, col 3, Funerals; after service at St Saviour's Cathedral. [S1148] Cemetery Marker - , Goulburn General Cemetery, NSW, Goulburn General, Church of England section, block 15, plot 3 & 4. [S160] National Archives Film - NSW Pioneers Index; microfiche, Entry no. 13245. [S222] National Archives Film - NSW Between the Wars Index; microfiche, Entry No. 16390. [S976] Newspaper - Goulburn Evening Post, issue of 14 Sep 1922, p2, col 2 Weddings. [S284] Index - New South Wales BDMs online, at http://www.bdm.nsw.gov.au, Death Reg. No. 200295/1980. [S396] Ryerson Index to Australian Newspaper Death and Obituary Notices, at http://www.rootsweb.com/~nswsdps/dpsindex.htm, Sydney Morning Herald of 31 Jan 1980. 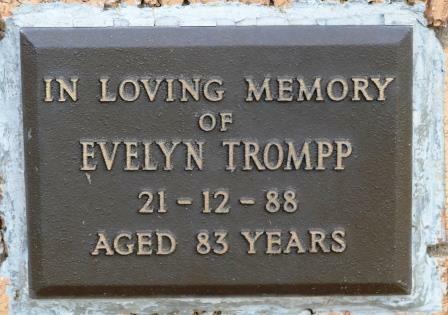 [S1149] Cemetery Marker - Goulburn Cemetery, Helen Gulson Memorial Wall, plaque. [S396] Ryerson Index to Australian Newspaper Death and Obituary Notices, at http://www.rootsweb.com/~nswsdps/dpsindex.htm, Sydney Morning Herald & Goulburn Post of21 Dec 1988; also Goulburn Post obituary 27 Jan 1989. [S284] Index - New South Wales BDMs online, at http://www.bdm.nsw.gov.au, Birth Reg. No. 3809/1909. [S284] Index - New South Wales BDMs online, at http://www.bdm.nsw.gov.au, Marriage Reg. No. 1963/1929. [S1152] Newspaper - The Sun (Sydney), isue of 17 Mar 1929, no. 1335, p26, col4, Yesterday's Social Events. [S284] Index - New South Wales BDMs online, at http://www.bdm.nsw.gov.au, Marriage Reg. No. 3855/1935. [S284] Index - New South Wales BDMs online, at http://www.bdm.nsw.gov.au, Death Reg. No. 8974/1947. [S590] Newspaper - Sydney Morning Herald, issue of 2 Jun 1947, issue 34147, p16, col 1, Deaths. 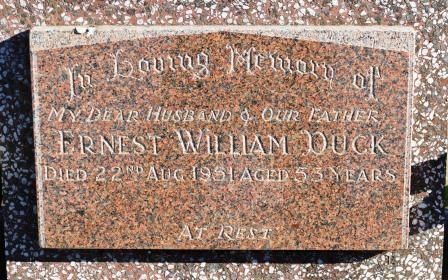 [S1148] Cemetery Marker - , Goulburn General Cemetery, NSW, Goulburn General, Presbyterian section, block 17. [S928] BDM NSW Registry, marriage record, Reg. No. 2455/1897. [S284] Index - New South Wales BDMs online, at http://www.bdm.nsw.gov.au, Death Reg. No. 2161/1948. [S590] Newspaper - Sydney Morning Herald, issue of 6 Jan 1948, issue 34333, p12, col 1, Deaths. [S284] Index - New South Wales BDMs online, at http://www.bdm.nsw.gov.au, Death Reg. No. 14186/1952. [S590] Newspaper - Sydney Morning Herald, issue of 15 Apr 1952, issue 35667, p1, col 7, Article and 16 Apr 1952, issue 35668, p24, col 2, Deaths. [S976] Newspaper - Goulburn Evening Post, issue of 15 Apr 1952, p4, col 3, Funerals; after service at St Andrew's. [S160] National Archives Film - NSW Pioneers Index; microfiche, Entry no. 3233. [S160] National Archives Film - NSW Pioneers Index; microfiche, Entry no. 12327. She and Leonard were divorced in 1929. [S926] BDM NSW Registry, birth record, Reg. No. 810/1902 (sighted). [S284] Index - New South Wales BDMs online, at http://www.bdm.nsw.gov.au, Death Reg. No. 44935/1974. [S396] Ryerson Index to Australian Newspaper Death and Obituary Notices, at http://www.rootsweb.com/~nswsdps/dpsindex.htm, Sydney Morning Herald of 23 Jan 1974. [S927] BDM NSW Registry, death record, Reg. No. 09620/1904 (death record). [S928] BDM NSW Registry, marriage record, Reg. No. 001830/1891. [S927] BDM NSW Registry, death record, Reg. No. 09620/1904, aged 65. [S978] Field of Mars Cemetery database, at http://fieldofmarscemetery.com.au/Home.php, Presbyterian section, grave 599.